We all have them: TVs, set-top boxes, speakers…. They’re rarely the prettiest items in our homes, but that doesn’t mean they have to detract from the décor. Made-to-measure media units are an excellent way to tame the clutter that often goes hand-in-hand with home-entertainment gadgets, and there are all sorts of clever design ideas that can turn them into attractive and eye-catching features that complement rather than dominate the rooms they sit in. Small spaces needn’t be a barrier to a stylish and practical media unit. We can design fitted furniture for even the most awkward of spots, from alcoves to corners to nooks under stairs and sloping ceilings. Conversely, we can also tailor designs to larger spaces. For example, if you have an open-plan home, you could use a media unit as a divider to separate and define different areas; you could even have shelves that are accessible from both sides, and mount the TV on a swivelling platform so that it can be rotated as needed. Every centimetre of space has been maximised thanks to this media unit, which was custom-built to fit the room’s unusual angled wall. 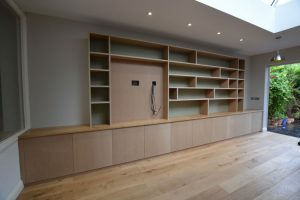 There’s space for a vertically mounted TV, as well as lots of useful cupboards. 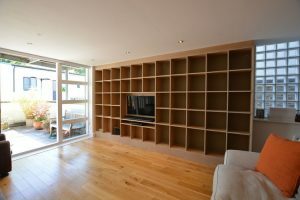 One of the benefits of a bespoke media unit is that it allows you to position the TV in the perfect spot, so have a think about what would work best for you. Would you like it to be mounted vertically on brackets, or standing on a surface? And what height should it sit at to ensure the most comfortable viewing? Tell us what you need and your TV’s measurements, and we’ll come up with the ideal solution. And if you want to hide your TV from view when it’s not in use, we can add a nifty sliding panel that can be pulled back in an instant. Also think about what space you need for set-top boxes, games consoles, speakers and the like. Open shelves are an excellent option for such gadgets, as they provide ventilation and allow remote controls to work seamlessly. TVs and set-up boxes often entail lots of leads and wires, but cable-management features mean these can be easily hidden, keeping your media unit looking neat and clutter-free. It makes dusting a lot easier, too! Think about how much space you need for DVDs, CDs and other items. Cupboards and drawers are a great way to hide practical bits and bobs which you might not necessarily want on view. This contemporary media unit combines low storage cupboards with shelves, meaning items can be hidden or displayed as needed. There are also removable panels for plugs and leads. Of course, media units needn’t just be about the TV. Why not add shelves that you can use to showcase family photographs, books and ornaments? You could opt for understated floating shelves, or break them up with vertical dividers to stop them overwhelming the space. This media unit isn’t just a space for the TV; it also makes a striking display thanks to lots of shelves for books, accessories and photographs. What’s more, all cables are hidden behind the unit, ensuring a neat and streamlined look. Do you want your media unit to blend in with your décor or stand out and make a statement? If you want a subtle look, you can paint it to match your walls; if not, how about choosing a contrasting colour or even a striking wood veneer? You could also opt for a sleek, contemporary finish, or a more traditional look with bevelled edges or decorative mouldings. 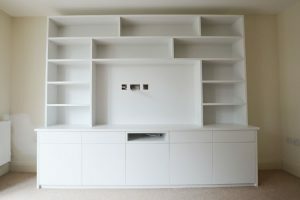 This bespoke media unit has been painted white to create a stylish and contemporary focal point. 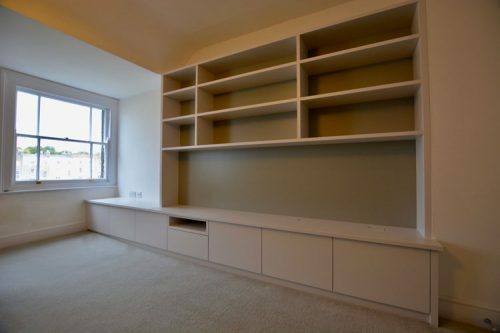 There are shelves for set-top boxes and books, plus handy cupboards and drawers underneath. Finally, how about incorporating LED lighting into your media unit? We can install subtle downlighters to illuminate treasured objects, and even ambient lighting that enhances the colours on the TV screen.